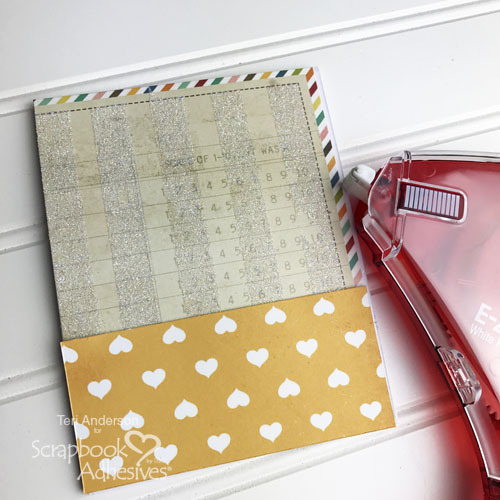 Have you ever wanted to add a bit of sparkle and glitz to your background such as subtle stripes in my card? Read on for an easy way to do just that with Adhesive Sheets! Hey, everyone! 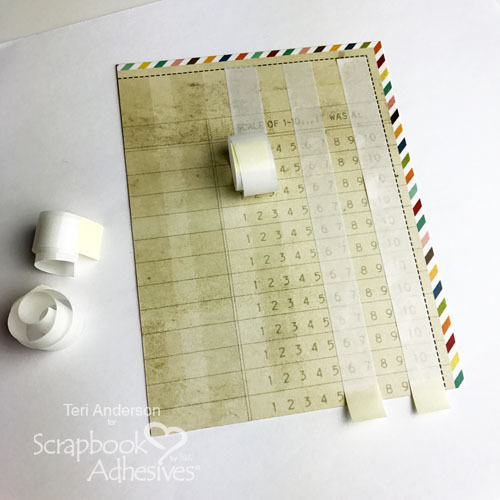 Teri here today with a tutorial for you! I’m going to show you how to make this card and how to add glittery accents to patterned paper! You are going to love this easy technique! Start by taking an Adhesive Sheet and cutting it into strips. Place the strips onto a piece of patterned paper. Be sure to firmly burnish the adhesive onto the paper with your finger or a bone folder. Then remove the backing paper. Adhere the panel to a card. Add some additional pieces of patterned papers to it. Then affix a couple stamped images to it. I like to use the 3D Foam Squares White Small Size to do this. Most of my stamped images are usually cut from white cardstock so I prefer to use the white foam squares ones over the black ones. Also, I love the pop the foam gives the images. It really helps make them stand out against patterned paper! Now you are going to create the sentiment. Adhere cardstock to one of the foam sheets included in the 3D Foam Creative Embellishment Kit. 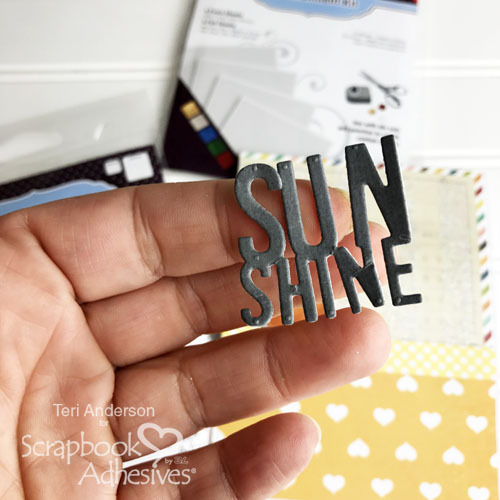 Set the “sunshine” die onto it and run it through a manual die-cutting machine! You’ll end up with a 3D sticker like this! View a quick video on How to Use 3D Foam Creative Sheets below. Adhere the sticker on your card. 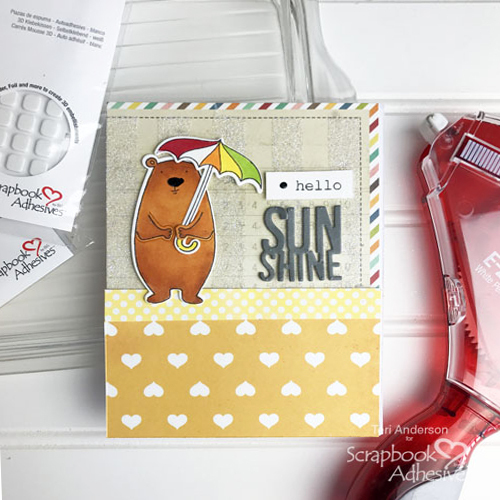 Finish the sentiment by stamping “hello” on a strip of cardstock and adhere it above the “sunshine” word. This entry was posted in 3D Foam Squares, Adhesive Sheets, Cards, E-Z Runner® Grand, Summer and tagged 3D Foam Creative Embellishment Kit with Foil, 3D Foam Creative Sheets Mix, 3D Foam Squares Mix White, 3D Foam Squares Small White, Adhesive Sheets 12x12" (25 sheets), Adhesive Sheets 12x12" (5 sheets), Adhesive Sheets 6x12", Card, Card Making, Doodlebug Design, E-Z Runner Grand Dispenser, E-Z Runner Grand Permanent Strips Refill, E-Z Runner Permanent Strips, E-Z Runner Permanent Strips Refill, E-Z Runner Permanent Strips Refillable, Ellen Hutson, Glitter, Simple Stories, Summer, Teri Anderson, Wear Your Adhesive on the Outside. Bookmark the permalink. 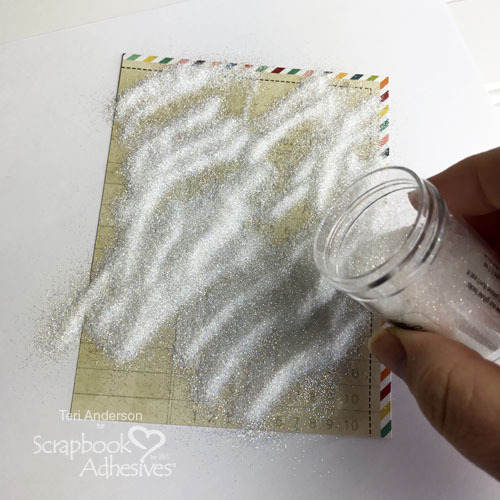 2 Responses to "Glitter Stripes Card Tutorial"
What a great way to add a little something extra to a card without going over the top. I love the touch of fine glitter and such a simple technique tfs.